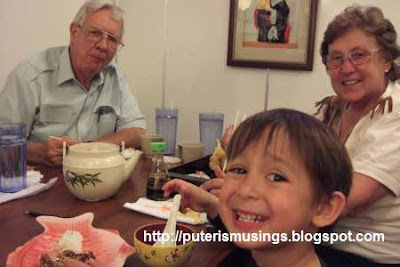 Puteri's Musings: I love sushi! There's a sushi restaurant right here in Galt run by a Korean family. Doug's uncle who is Japanese says that sushi made by Koreans are not as good as those made by the Japanese! Of course he would say that. I haven't eaten at many sushi restaurants so I can't judge and compare but what I do know is that the sushi available at this sushi place in Galt is more than good enough for me. My kids love rice with the miso soup and also the barbecued teriyaki chicken. Doug loves the bento boxes, whereas I on the other hand, love the sushi with raw fish on it! The more kinds of fish the better! I didn't like sushi all that much when I was first introduced to it. That reminds me of a friend who hated the food served on Japan Airlines because it was mostly sushi. That was then, when her palette was not that "developed". Now she says, she can't get enough of sushi! hehehe...aku enda kala nguji shushi.Bisi sekeda madah sedap,bisi mega madah nadai sedap..
Enda kala nguji shushi nuan, pia? Enti baru nguji anang ngorder ka bisi raw fish, enggai ka enda nyamai sepi nuan ila! I love sushi! So nice....sushi..not a fan of it..but GF loves it...:) Glad u had fun there. Pat, nyamai! Uji dulu baru nemu ni nyamai ni enda! Heheh. Nightwing, even though not particularly fond of sushi, you still go, eh, to keep the gf happy! Good for you! 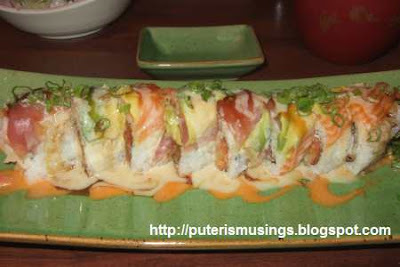 Puteri ... like you, I acquired the taste of sushi over time. My favourite is salmon. What was in Mama's Special? Looks very rich. Duncan SO cute! Oh yes, Rita, that was rich! Inside the roll is spicy tuna, and on the top are three different fish, salmon, tuna and err, don't remember the third one .. it has white meat. Duncan knows how to wink at you if you praise him! Haha,he's going to be a heart breaker!